You are here: Home / News / The Accumulate group tries out yoga and ceramics. The Accumulate group tries out yoga and ceramics. The Accumulate group tried out yoga and ceramics this year. Both of these are new activities for the group, and the participants left these both wanting more – which is always a good sign! We now have a community of learning and this is something we want to build on as the project continues and grows. The Accumulate participants now greet and high five each other and are linked through their creativity and their talents, they are empowered, positive and are ready to take on new challenges. And that’s what Accumulate is all about, and that is success for us and for the participants. 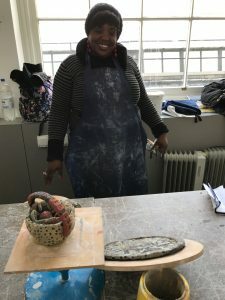 Olive, a participant, emailed in after the Accumulate ceramics workshops and said “I felt so confident in myself when you told me I’m doing well and showing me new task and how to make things easier for me” and here she is, very proud, with the plate and bowl that she made. Thank you to our new partners for these activities – Level Six Yoga at Peckham Levels and the learning team at The Victoria and Albert Museum. We are now starting to get ready for the Accumulate photography exhibition. Once again we will be having the exhibition at The Guardian building in Kings Cross. Our thanks are due to them for their continued support. The theme of the exhibition is Displacement and at the private view on May 17th we will also be awarding three scholarships for selected Accumulate participants to be able to study on the Access to HE course in Digital Media and Design at Ravensbourne. Please do email info (at) accumulate.org.uk if you would like to attend the private view and are not already on our mailing list. 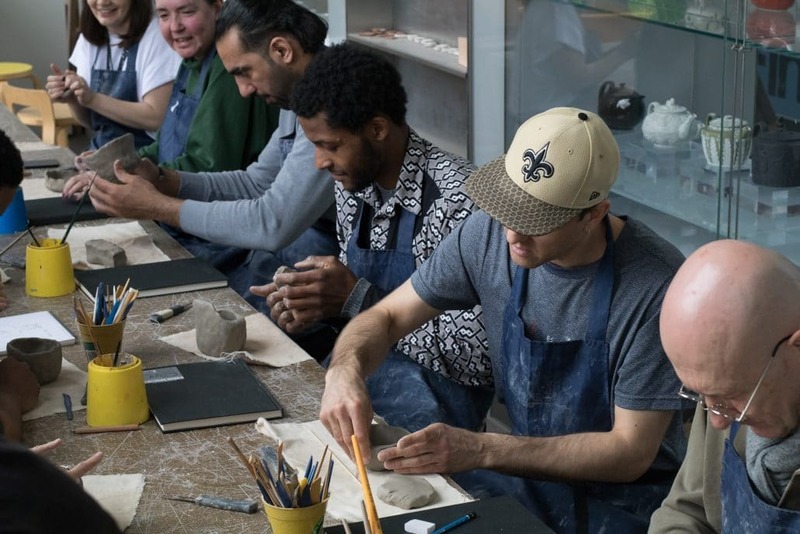 https://accumulate.org.uk/wp-content/uploads/2018/04/The-Accumulate-group-at-the-ceramics-workshop-e1523212492819.jpg 200 300 Marice Cumber https://accumulate.org.uk/wp-content/uploads/2018/06/Accumulate-Logo.png Marice Cumber2018-04-08 18:45:072018-04-08 18:45:07The Accumulate group tries out yoga and ceramics.